Buy Instagram Followers – Should You? It’s natural to want more followers on Instagram. Some people have thousands of followers and receive the same amount of likes effortlessly, it seems. If you’ve been trying to grow your Instagram without success, purchasing followers is tempting. Buying Instagram followers is not a good idea. Most services that sell a certain number of followers per price are really only hurting your Instagram. We’ll go over the difference between fake and real Instagram followers, how buying followers works, and the right way to build up your Instagram account. If you sift through Google, you’ll find various services offering cheap Instagram followers. For a one-time fee, these websites will sell you anywhere from 100 to thousands of followers, sometimes only for a few bucks. If these services seem shady, it’s because they are. The followers they are peddling are almost always all fake, bot accounts. Most have weird, long usernames that are clearly fake, and they probably don’t post much if at all. You may be thinking, “so what?” Many Instagram users may not care if their followers are real people or bots, so long as their follower count is high and their Insta clout is in tact. Fake followers are easy to detect: their usernames are usually an odd, long combination of letters and numbers. They’ll have almost no posts of their own. If they do post, it’s very likely spam that could hurt your devices if you click through to their links. They won’t like or comment on any of your posts. Buying fake followers is not a good look, especially if your account is for your business or brand on Instagram. You may think having a high follower count will help, but if anyone looks deeper they’ll see that your posts get very few likes and most of your followers are fake. This tells others that your brand doesn’t have a real following, and may suggest that you don’t deserve their follow or their business. There are a few reasons why you shouldn’t buy followers. One is that these fake accounts may eventually unfollow you, or they’ll get deleted. Instagram does not like fake accounts, and they are continually working to get rid of Instagram bots, inactive users, and fake accounts. You could pay for 1000 followers and get them initially, but those numbers will very likely drop off shortly after your purchase. Another issue with buying fake followers is that they’ll probably never like any of your posts. Sure, you’ll have a high follower count and a good follower/following ratio, but your photos won’t receive any more likes than normal. This actually hurts your engagement rate on Instagram, which will drop when you have more followers but the same amount of likes as before. 100 engaged followers are better than 1000 followers who will not interact with your posts. If bots do engage, their comments are very likely automated and therefore won’t be very relevant to your post. Users with fake followers have received comments in different languages, comments that are totally irrelevant to their content, or inappropriate comments. Sometimes the comments are ads, making it even more evident that your followers are fake. Finally, Instagram may flag your account if it sees that you are buying fake followers. As we’ve said, Instagram is working to eradicate fake users and get rid of bots, so they flag unusual bot activity. Even though your account is real, you may be flagged by Instagram for violating Instagram’s terms of service. 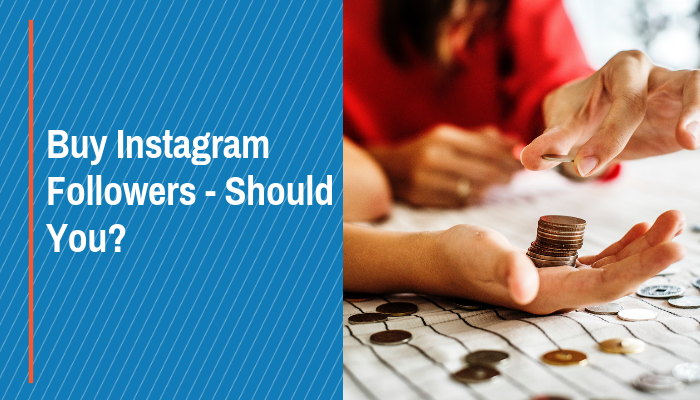 Businesses and brands on Instagram should be especially wary to purchase followers. Buying fake followers destroys your credibility, making it seem like you don’t have real fans at all. It also shows that your business cuts corners, which may negatively impact your brand. Cheap followers are fake, meaning there isn’t a real person behind those accounts. That means that your fake followers will not be buying your products or services. As a business, there really isn’t a point to market your products to fake followers. Instagram influencers are influential because they have grown a following on the platform. As an influencer, if your followers realize that you purchased fake followers to boost your account, you’ll lose credibility. Buying fake followers is not the best way to grow your account. Luckily, there are plenty of other ways to get your first 1000 Instagram followers, or your next 1000. If you’re ready to spend money to build up your Instagram following, Social Buddy is an Instagram growth service that can help you get genuinely real followers. Social Buddy works by getting you real, targeted Instagram followers based on your interests and industry. With Social Buddy, you can grow your followers and improve engagement. Rather than those weird, fake followers, you can drastically increase your followers with real people who will like your posts. Social Buddy targets followers who are actually interested in your content, so you’ll receive more likes and comments as your followers grow. Not convinced? Check out our case studies or reviews to see how Social Buddy has worked for other users!